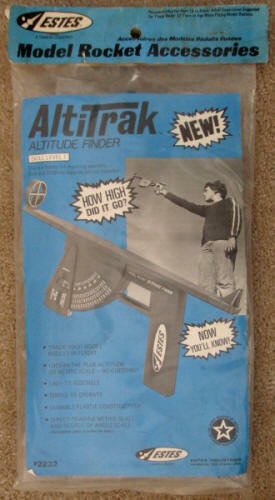 This is the vintage Estes AltiTrak. 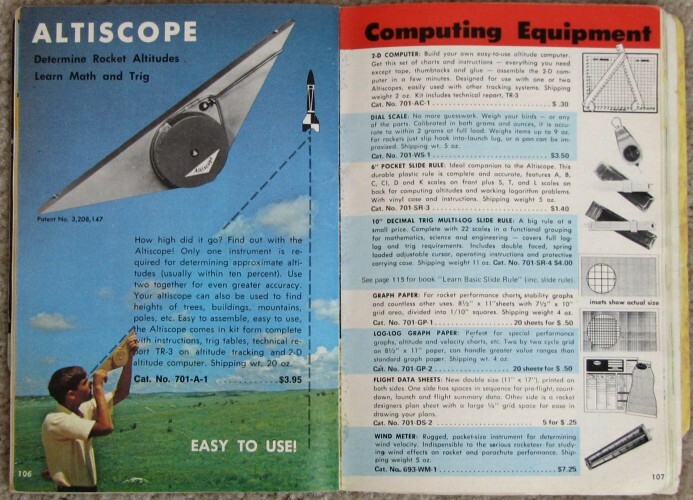 The one I had back in the 1970s was made of wood that went by the name Altiscope (see thumbnail). The AltiTrak one is a newer incarnation made of plastic and is held like a pistol. Both models work on the right triangle completion principle. You stand off a predetermined distance from where you expect the rocket to be at apogee (its high point of flight), and then follow it up with your instrument. At the highest point, you lock the angle indicator on the protractor. You can see the concept in the picture to the left (click for a larger version). 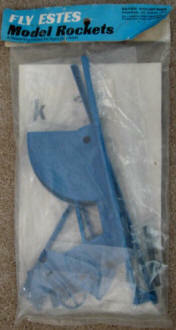 Now, when I was a teenager trying to use my Altiscope, I didn't know a tangent from a schmangent. Fortunately, Estes provided a table of values. Yes, teachers had attempted to learn me about trigonometry, but I wasn't having any of it.